All contents indicated are exclusively for the information of those visiting our Internet site. Moreover, the information provided by Paul Weber GmbH & Co. KG on this website is subject to ongoing control and is up-dated regularly. Nevertheless, it may be possible for data to have changed in the meantime in spite of careful verification. For this reason, Paul Weber GmbH & Co. KG accepts no liability for and provides no guarantee of the accuracy, completeness and up-to-dateness of the information provided on these pages. This applies also to all the websites to which the hyperlinks to be found here provide access. Paul Weber GmbH & Co. KG is not liable for the content of such pages. 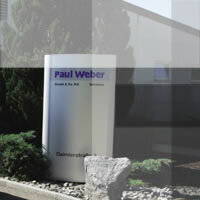 Moreover, Paul Weber GmbH & Co. KG reserves the right to change or amend the information provided. The documents made publicly accessible on this Internet site, including other data belonging thereto such as e.g. texts, images, graphics, programming codes, are protected by copyright. For documents provided in electronic form via the data network the copyright law (UrhG) is applicable without restriction. In particular, the following is applicable: individual reproductions such as copies and prints may be made only for private and other personal use (Section 53 UrhG). Producing and distributing further reproductions is permitted only with the express consent of the originator. The user is responsible for complying with the statutory requirements and can be held responsible in the case of misuse. It is permissible in principle to link our Internet pages provided we are informed beforehand by E-mail. In the case of links the contents may be neither altered nor falsified.